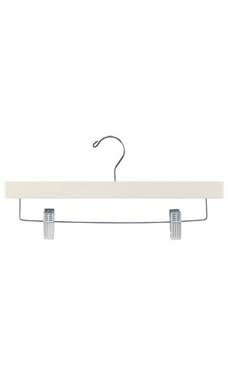 The Ivory Skirt/Pants Hangers from Store Supply Warehouse are a dashing addition to you collection of store supply necessities. Finished with a soft ivory color, these 14" wooden pants and skirt hangers will flatter any garment with a charming touch of purity. Featuring a silver metal hook and clips to accent the hanger bar, these hangers are strong and durable, hanging any garment neatly on merchandise displays and clothing racks. Sold in cases of 50 at wholesale prices!